Physiotherapists provide services to people and populations to develop, maintain and restore maximum movement and functional ability throughout the lifespan. Physiotherapist practice includes the provision of services in circumstances where movement and function are threatened by the process of aging or that of injury, disorders, or diseases. Physiotherapist practice is concerned with identifying and maximising quality of life and functional movement potential, within the spheres of promotion, prevention, maintenance, intervention/treatment, habilitation and rehabilitation. This encompasses physical, psychological, emotional and social well-being. This course was established to fulfil societal and market demand on physiotherapy profession. Currently, only limited numbers of higher education institutions in Malaysia are offering this course and UTAR is one of the pioneer academic institutions to offer such a programme. The programme has been fully accredited by the MQA since August 2014 [MQA Approval (R/726/6/0061)10/20(A10816)]. It is envisaged that this course will produce graduates that will help fulfil UTAR’s vision- “To be a global university of educational excellence with transformative societal impact”. To prepare graduates with necessary theoretical and clinical knowledge in order to function as safe and competent physiotherapy practitioners. To produce graduates with clinical exposure and training for conducting safe assessment and implementation of evidence-based treatment. To produce graduates who can practice effectively with professional attitude, integrity, ethical values and conduct in both health care organization and community. To equip graduates with requisite soft skill, including communication, managerial, team work and problem solving skills to promote leadership and entrepreneurship. - Provide the educational experience, practical training and technical competence necessary for the practice of physiotherapy. - Prepare graduates to work as physiotherapists who are professionally competent and who demonstrate good ethical judgment and compassion in the treatment of patients. - Train students to develop good communication skills, critical thinking, leadership quality, ability to make independent clinical decision, and to engage in continual professional development as part of life-long learning. The course is offered in three trimesters every year. Students will gain clinical exposure at hospitals, clinics and other health-care centres beginning from second year of the programme. Year four of the programme will focus on clinical placement in specialized area such as orthopaedics, neurology, paediatrics, etc. Students will also gain knowledge of relevant research methodology and are required to submit a research project in third year of study. For more details on subjects offered in each year please refer to the course structure. UTAR graduates will help alleviate the current national shortage of qualified graduate physiotherapists, and be the trainers for future generation of physiotherapists. 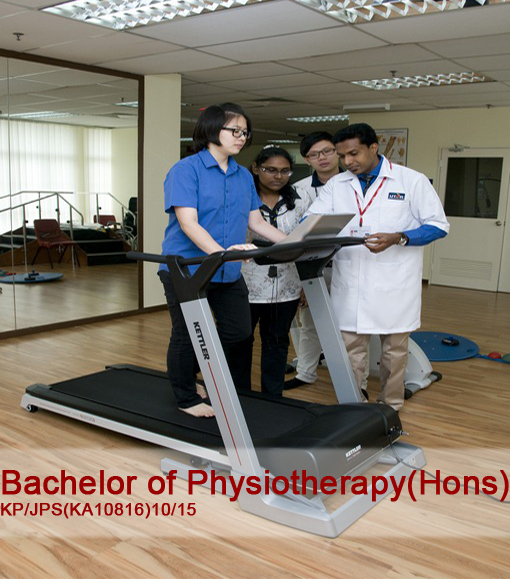 Graduates will be eligible for registration with the Malaysian Physiotherapy Association (MPA). Graduates can expect to find national or overseas employment as physiotherapist in various health sectors such as hospitals, hospices, nursing homes, geriatric care centres, physiotherapy clinic, community settings, health & fitness clubs, education and research etc. Graduates may also apply for post-graduate education locally or internationally at institutes of higher education.